Hannah Jenner: What draws a human being to want to spend an extended period of time in a pretty hostile environment is a question I have pondered a lot over the last month. Existing in a cramped space with none of the basic facilities we all use in our daily lives ashore and eating a limited, largely uninspiring diet sounds more like punishment than pleasure. Yet for some reason I find myself compelled to be out there, enticed by the challenge. The challenge is twofold: there is a competitive element and a survival element. To sail doublehanded is tough. To race double-handed for 30 days takes tough to a new level. For the two of us aboard 11th Hour Racing, this TJV was not tremendously physically demanding. Our test was a mental one: staying focused when there was no immediate competition to race against, keeping motivated when it seemed we simply could not keep on top of the problems on board, and remaining intact as a team. The boat can be the fastest one out there, but if the team’s not a solid, cohesive unit you may as well sail with a concrete block attached to your keel. We had three very plausible reasons to quit this race. Forestay failure, sat comms failure and rudder seal failure resulting in thousands of litres of water pouring into the back of the boat. I will not lie – we seriously contemplated quitting. Facing our first setback, we knew it would be a tough call to get back in the game, but try we would even if the deficit to the lead boat was around 700 miles by the time we re-hoisted our sails. The second kick in the shins proved to be the greatest test of our resolve. 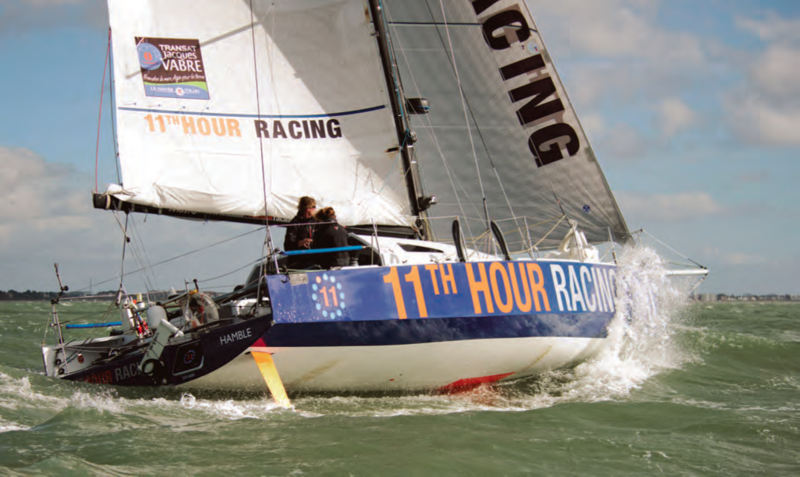 Communications systems are vital in yacht racing. You need weather information to make the right strategic decisions, yet the last grib file we saw was downloaded just off Finisterre, a long way from the finish. We checked every inch of wire, changed the end fittings, cleaned any hint of corrosion and checked every component inside the dome. Once we’d concluded the situation was terminal, we had a few very difficult days. After passing the Cape Verde Islands, we never again received a forecast. The frustration of watching the fleet sail away as we guessed at which gybe might be more profitable reached fever pitch just before dawn one day between the Canaries and Cape Verdes. 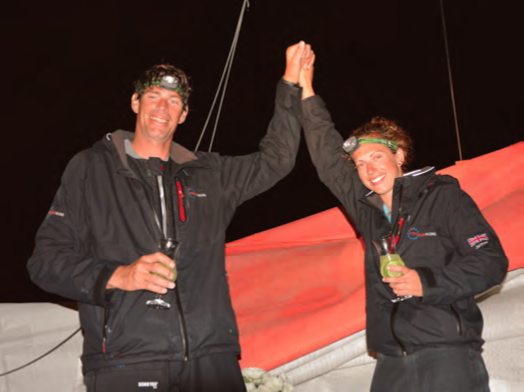 That combination of tiredness and pushing hard left the big A2 spinnaker wound tightly around the forestay, and for the first and only time in the race we exchanged heated words. It was just a vent of pent-up frustration, and it restored our sense of humor. Our race was about more than just an on-the-water result. We had also pledged to run a campaign with a minimal impact on the environment. Despite finishing at the back of the fleet, I feel proud of what we achieved. This was an immense challenge, and we have walked away as friends. We never gave up, and sailed over 6,000 miles in 30 days producing only one bag of trash. If we can do it, then any sailor can follow in our footsteps. Rob Windsor: We spent 30 days at sea, the longest I have been out there in one shot. The race didn’t end up the way we had planned. We had some issues, but I think we did a good job of solving the problems that we could and carrying on. In the end we finished, which is a pretty big accomplishment in itself. Since we had a month at sea, we really had a chance to try out 11 Winning Solutions. Hopefully, the example we set will get a few people excited about protecting the ocean by implementing them into their own campaigns or cruising plans. 1. Hydrogenerator – The power a hydro puts out, even at fairly low boat speeds, will keep most boats charged up. We were able to keep our batteries charged for the entire race. Cruising boats looking to supplement their power should really consider this. 2. Watermaker – The biggest thing about this was how many single-use bottles we eliminated. We all need to think about how we impact out environment, and not using single-use bottles is an easy way to start. 3. Optimized Nutrition and 4. Ocean Farming – Having a nutrition plan to keep us energized was great. The point of ocean farming was to show that you can grow your own food anywhere – we grew plants to eat on a racing boat in the middle of the ocean! This is something that cruising sailors can use. I had never grown anything. If I can do it, anybody can. 5. Waste Reduction – The biggest part of this was not throwing anything overboard. This campaign was a real eye opener, and I am a changed man. When I see people throw stuff overboard it makes my blood boil. The ocean is my office and it is a beautiful place, not a garbage dump. 6. Solar Panels – The solar panels were great, putting out enough power to keep us charged when we didn’t have the hydro in. 7. Education – For me, this was the best part of the program. Rozalia Project for a Clean Ocean did a great job of helping us reach as many students as possible. If we can teach our children to protect and respect the world we live in, we all win. 8. Carbon Offset – This one speaks for itself. 9. Citizen Science – We did a data sheet for 5 Gyres every day for a one-hour period, listing what we saw in the water. For most of the race we didn’t see a thing, which is a good thing…and we did this data collecting without burning a single drop of fuel. 10. Crossfit – I’m not a gym guy and I thought I would hate Crossfit, but I loved it. We use a lot of different muscles in sailing, and Crossfit is a great way to work on all of them. I’m going to make it part of my routine. 11. Solar Kettle – The solar kettle works, but the time it takes to boil the water is a bit long. When I want coffee, I want it now. My advice to all sailors is: Get out there and use your boat. Keep some of the things we tried in mind, and act on them when you can. We all make a difference.